My tooth got knocked out. What do I do? A tooth can be knocked out (avulsed) from trauma. If the avulsed tooth is a permanent tooth (or if you’re not sure), call a dentist immediately. If a tooth has been out of the mouth more than an hour, the possibility of re-planting it successfully drops off dramatically. If you are not sure if the tooth is a permanent tooth, don’t try to replace it in the tooth socket. If the patient is unwilling or unable to cooperate to allow re-insertion of a permanent tooth in its socket, and the tooth must be transported outside the mouth, you can place it in a container of Hank’s Balanced Salt Solution (available at most pharmacies, and often kept on hand by athletic trainers) or milk. Do not use soap or other solutions on the tooth root. Why do my teeth (or dental restorations) keep breaking? Teeth and dental restorations which continually break following repairs are suggestive of an ongoing tooth grinding habit, or improper bite relationship (malocclusions). The side of my molar tooth chipped off. What should I do? Learn more about chipped teeth. It is common for molar teeth (especially lower molar teeth) to have a complete side of the tooth (buccal or lingual cusps) chip off at approximately the gum line. When this happens, it may be possible to place a bonded filling over the exposed dentin as a temporary means of preventing the gums from growing over the fractured area, to protect the tongue from being lacerated by the sharp fracture margins, and to cover exposed dentin. Generally this involves smoothing away any weakened tooth enamel, beveling the fracture edges (margins), isolating the tooth from mouth moisture to keep it dry while it is being repaired, and bonding a flowable composite resin filling material over the chip. Most of the time, it is possible to make this repair without using local anesthetics. The repair may last longer if it is kept out of function (i.e. the patient cannot bite on it), and if it is shaped so that any chewing forces on the repair would be cannot apply leverage that might fracture the tooth. Teeth that are repaired in this way generally require a crown or onlay to restore proper function; but the repair can stabilize the tooth, eliminate sharp edges, and cover the exposed sensitive dentin long enough for any other dental needs to be evaluated and prioritized. I chipped/broke my tooth. I think the nerve is exposed. What should I do? A chipped tooth can represent a symptom—for example, of tooth grinding. It can also be a diagnosis—a condition which resulted from trauma. It’s important to know what caused the chip so that treatment can have long term success. The cost of restoring a chipped tooth depends on how badly the tooth is chipped, and the procedures that are needed to restore it. Chipped teeth are classified by the amount and type of tooth structure involved. Those that involve only enamel are considered Class I chips. Although they may be of cosmetic concern to the patient, these are frequently asymptomatic. This is not always the case, however, as sometimes the energy from a traumatic injury is transferred into the nerve and blood vessels inside and around the tooth, causing them to become injured and inflamed—instead of dissipating the energy by chipping the tooth’s enamel shell. Depending on the degree of inflammation, the tooth may ultimately undergo irreversible pulpitis and/or become a dead tooth. The tooth may also develop an infection (abscess). Usually, Class I chips themselves can be restored by bonding tooth colored filling material known as composite resin directly to the tooth after any weakened and unsupported tooth enamel are removed. 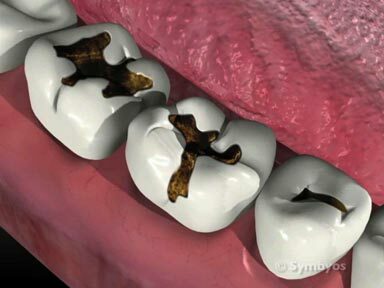 The injured tooth will generally need to be monitored over a period of several months for signs that the nerve and blood vessel tissue inside of it may become inflamed, infected, or necrotic (i.e. non-living). 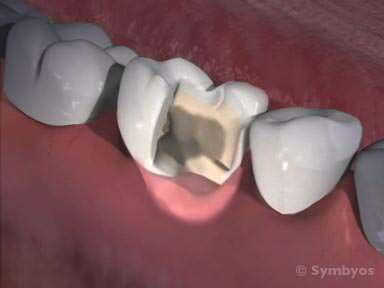 Sometimes a tooth which has sustained an apparently minor injury will develop an abscess many years after the injury. Chipped teeth which develop these types of complications usually require root canal treatment to remove the inflamed/infected pulp tissues and seal the tooth against future bacterial invasion. Class II chips are those that fracture through enamel and into dentin, without exposing the pulp (nerve and blood vessels). Class II chips are often sensitive to cold and sweets, because those types of stimuli allow fluid to move into and out of the “pores” of the exposed dentin. The fluid movement causes pressure changes inside the tooth which are perceived as pain. Generally, Class II chips are restored by bonding tooth colored composite resin directly to the tooth after removing weakened, unsupported tooth structure. Depending on the amount of tooth which has been lost, porcelain veneers, onlays, or crowns may provide more durability, although directly bonded composite resin is extremely durable and esthetic in many applications. Often, a Class II chip will not require additional treatment like root canal treatment, because the energy of the injury was fully expended in chipping the tooth, and did not damage the living tissues inside of it. Class III chips are those that fracture through the enamel and dentin, and expose the nerve and blood vessels inside the tooth. This allows bacteria access to the hollow interior of the tooth, and from there to move into the jawbone around the tooth, creating an infection (abscess). If there is enough solid tooth structure protruding through the gums to allow the tooth to be fixed, it will generally be necessary to remove the exposed nerve and blood vessels from the tooth, and to seal the hollow interior against future bacterial invasion. This is achieved through root canal treatment. Sometimes it will be necessary to reinforce the remaining tooth structure by placing a post into the root canal after it is sealed. Posts may be made from fiberglass, stainless steel, titanium, or cast metal (most commonly high noble gold to avoid oxidation and corrosion). 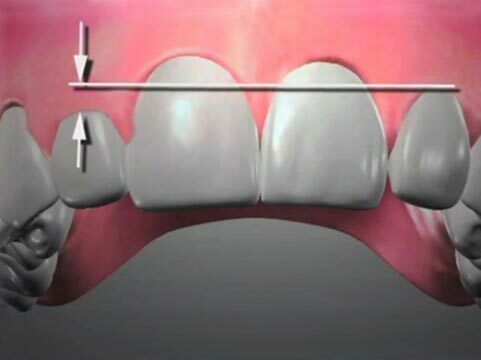 The core of the tooth will be rebuilt around the reinforcing post, and often a crown or onlay will be placed over its rebuilt core to protect the entire tooth from splitting apart. Teeth which have chipped into the pulp of the tooth are easy to identify because a red spot can be observed in the center of the root cross section. Frequently there will be bleeding from the red spot, which is the exposed tooth pulp. Pulp is made up of nerve and blood vessel tissue. What typically causes cracked teeth? Cracked teeth can represent a dental symptom; for example, bruxism. It can also be a diagnosis—a condition which resulted from trauma. It’s important to know what caused the crack so that treatment can have long term success. External resorption is an inflammatory process in which a tooth root is dissolved away from the root surface inward, toward the pulp. As the tooth resorbs, the space it previously occupied is replaced with bone. There are a variety of factors that can pre-dispose a tooth to external resorption, including rapid orthodontic tooth movement, use of heavy orthodontic wires, trauma to the tooth in which it was displaced (luxated) or avulsed (knocked out completely) and re-planted. If the inflammatory process begins inside the tooth, where the blood vessels and nerve tissue (pulp) are located, root canal treatment may be successful. In many cases, however, the process continues, and the affected tooth is removed to prevent the process from affecting neighboring teeth. 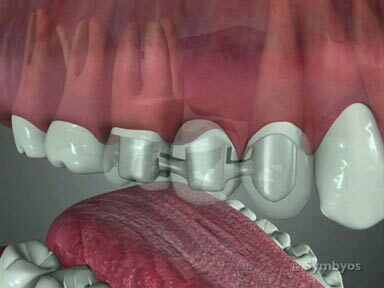 Externally resorbed teeth are often excellent candidates for removal and replacement with dental implants. Should I be concerned that my teeth have pits in them? Pitted tooth enamel is usually due to severe cases of fluorosis, or enamel hypoplasias. Both conditions arise from irregular enamel formation during the development of the teeth.